Some families talked about the Cowboys-Redskins football game at Thanksgiving. Others discussed politics. This Thanksgiving, my mom was concerned about her finances. “I’m worried that I’m taking on too much risk,” she said. As someone who works in the financial industry, I know that panic selling is one of the worst financial moves someone can make. But it’s perfectly understandable why investors do it. After all, every correction or market panic is a grim reminder of the 2008 financial crisis, which hurt many Americans deeply as the S&P 500 Index lost more than 50% in less than two years. As the market struggles at the close of 2018 and has given up all of its gains for the year, it is important to maintain a balanced and diversified portfolio in order to survive the low points. High-flying tech and cannabis-related stocks delivered some stunning gains earlier, but investors need to remember that low-risk investments are an important part of any portfolio. Those include conservative assets such as bonds and certificates of deposit. Safe assets can provide a steady, dependable yield. They allow you to plan ahead and know how much money you can expect to have in your retirement. Regardless of what happens with the economy and the stock market, you can rely on these investments. If you’re someone who’s retired or getting close to retirement, they should make up the majority of your portfolio. And the older you get, the more you should depend on safe assets like bonds. Some experts suggest using your age as a guideline. For example, if you’re 60 years old, you should have at least 60% of your portfolio in safe investments. If you’re 80 years old, that number goes up to 80%. Of course, the natural instinct when stocks are falling and everything looks grim is to pull back completely to fixed income or even cash. But the name of the game is balance. Some of your portfolio should be focused on growth too. And the best place to look for growth is still in the stock market. According to CNBC, from 1927 to 2016, the S&P 500 Index’s average return was 9.8%. And that doesn’t include 2017’s stellar return of 19.4%. The gray vertical lines show major recessions. 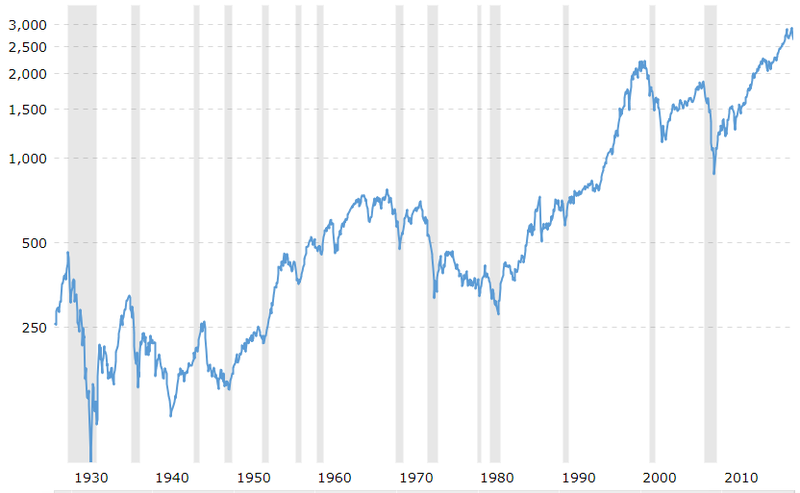 No matter how bad things get, stocks always rebound and make new highs over the long term. Out of the last 90 years, the S&P 500 went up in 66 of them, or almost 75% of the time. As long as you have a diversified portfolio, you will be able to weather any market storm and not sustain the same substantial losses as someone who is fully invested in a single asset or sector. Constantly watching how your stocks are doing doesn’t make you a better investor. It just stresses you out and wastes your time. Or even worse, you let your fear get the best of you, and you rush to dump your stocks. Then you get to watch on the sidelines as other investors enjoy the rebound. Take steps now to make sure that your portfolio is properly balanced and diversified. Develop an investment goal for your portfolio, and stick to it. And remember that, as awful as the 2008-2009 market crash was, stocks are up nearly 300% from that bottom. That means if you’re smart with your investments, it’ll work out in the long run.